As-salamu alaykum and hello everyone ♡ . Oh my it feels like ages since I make my last Wishlist Wednesday! It was last few month if I am not mistake? I love this series, to my own opinion because I just like it. Hehe. Being a girl you can never end your wishlist right? True? Not true? True! When it comes to furnishing, I am very picky. When I get a house later, I'll make sure I'll get everything in order, as I wish I want it to look like. I love interior design stuff. I was once had a dream of becoming one but... I just don't have the support. Since I was a kid, I have been love IKEA. Like seriously. No furnishing company can win my heart. I just love how simple and practical IKEA have in their furnishing items. Oh yes, I even make my future husband promise that he will fill our house with IKEA stuff, I don't mind getting a small house but it has to be filled with IKEA furniture. Hehe. This year resolution as I mention I really want to reorganize my makeup storage. So I have do so many research as well as looking to my "way" of reaching and organizing my beauty stuff. I came out with a plan. I want this 3 drawer from HEMNES. It retails for RM49. Pretty expensive but I just love how HEMNES furniture looks. It looks modern as well as "shabby chic" kinda design and I think it is going to look super cute in my room! hehe. 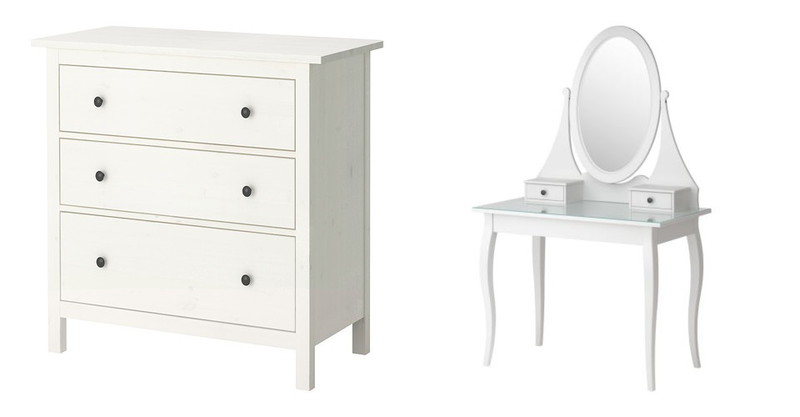 The second furniture I want is this beauty, HEMNES vanity table that retails for RM999. Hm.. maybe I get this later when I already have my own "room". Haha. So my first target os that 3 drawer. I wanna keep all my beauty products there. First I wanted the MALM 3 drawer but that have a 80cm width, but this HEMNES is bigger with 100cm width. It fits perfectly for my whole 5 plastic drawers that I have now. Weee! I have been eating so humble these month to save! RM. RM. RM. *Above picture taken from WeHeartIt. Do you love Ikea? Do you? Do you?